South Korea’s automakers will see lackluster sales in their three major overseas markets next year as well as at home due to slowing economies, trade disputes and rising lending rates, a research institute affiliated with Hyundai Motor Group said at a seminar Thursday. Hyundai Motor’s Global Business Intelligence Center predicted that vehicles sales in the US would be about 17 million next year, down 1.4 percent from an estimated 17.25 million this year. Sales in Europe would drop 0.2 percent to 17.8 million, while those in China would inch up 0.2 percent to 23.2 million. At home, 1.79 million units was predicted to be sold in the local market next year, down 1 percent on-year from 1.8 million units this year. 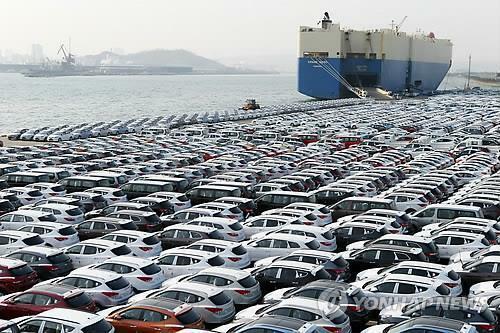 “Despite an extended special consumption tax cut for passenger cars, Korea’s weakening economic outlook for 2019 will impact vehicle sales here two years in a row,” Lee Bo-sung, head of Hyundai Motor’s Global Business Intelligence Center, said in a seminar on next year’s global automotive industry outlook at Hyundai Motor Group headquarters in southern Seoul. In a bid to foster Korea’s weakening economy, the government earlier this week approved of extending a 3.5 percent special consumption tax reduction until the end of June 2019, which was initially due to expire at year-end. In response to requests from local auto parts manufacturers for the government to take a more active role for them to overcome lackluster passenger car sales, over 3.5 trillion won ($3.1 billion) will be injected to support parts makers, the Ministry of Trade, Industry and Energy had said earlier this week. The South Korean won is projected to remain around 1,100 won against the greenback in 2019 due to a weakened US dollar in the second half of next year and stronger Chinese yuan. On a global scale, overall passenger vehicles sales will drop 0.1 percentage points next year to a total 92.4 million units due to poor sales in the US, Europe and China. “This year emerging markets saw a 7-8 percent increase in vehicle sales, but it was not enough to offset slumps in the US, Europe and China. Sluggish growth in the major regions will continue throughout next year,” Lee said. Amid slowing overall growth, sales of eco-friendly vehicles are expected to surge 18.7 percent on-year to 4.01 million units worldwide on China’s New Energy Vehicles mandate.